For years Toyota and Nissan have been battling it out to be the best. 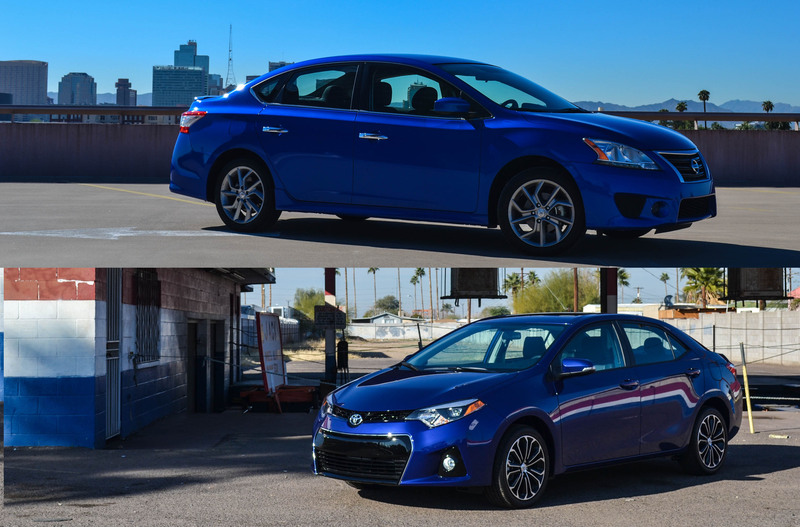 The last couple of generations, the Nissan Sentra would have been the better choice; however, now both the Sentra and the Corolla have been revamped to the modern ways. And since we have now driven them both, it’s time to see which one we’d take home. Putting the two monroney’s side by side, it’s hard to really see a difference between the two. They both have a 1.8L engine that uses a CVT transmission, same amount of features, and even virtually the same blue paint. But there is more to each than what is on the spec sheet. 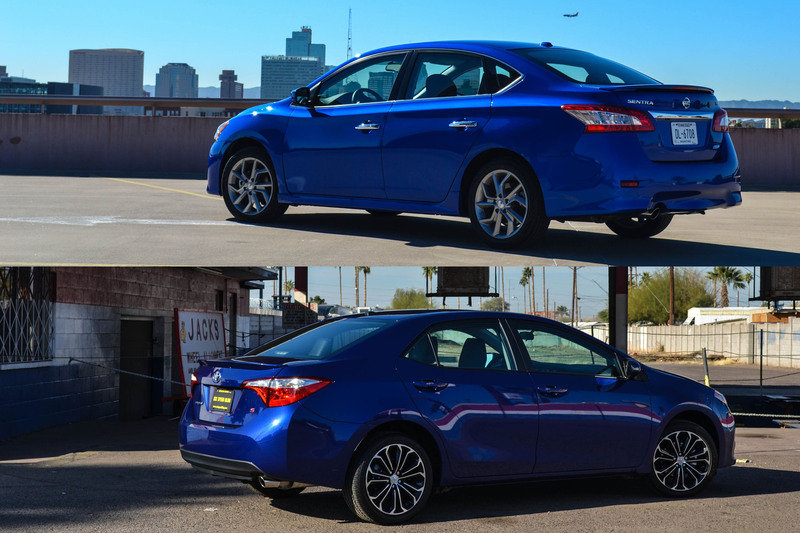 When we drove the 2013 Sentra SR in the later part of October 2013 it arrived sporting the Metallic Blue paint featuring the SR Driver Package and Navigation Package with a 5.8” touch screen and Push Button Start… along with other features. The Sentra had an assortment of modish features that helped break out of the ordinary adding 17” smoky alloy wheels, LED accent lights and LED tail lights. Then the 2014 Corolla S arrived in January 2014, and it too was decked out in a color known as Blue Crush with its piano black front fascia. There was no doubt it was the S model with its standard LED headlamps and 17” alloy/black wheels. The Corolla hadn’t been spared on the options list showing off the Driver Convenience Package with its Push Button Start and 6.1” Entune Navigation. Option lists aside; when it came to the interior quality both were good in their own special way. The Sentra has a smooth soft touch dash accented by silver painted carbon fiber and black cloth seats with blue confetti. 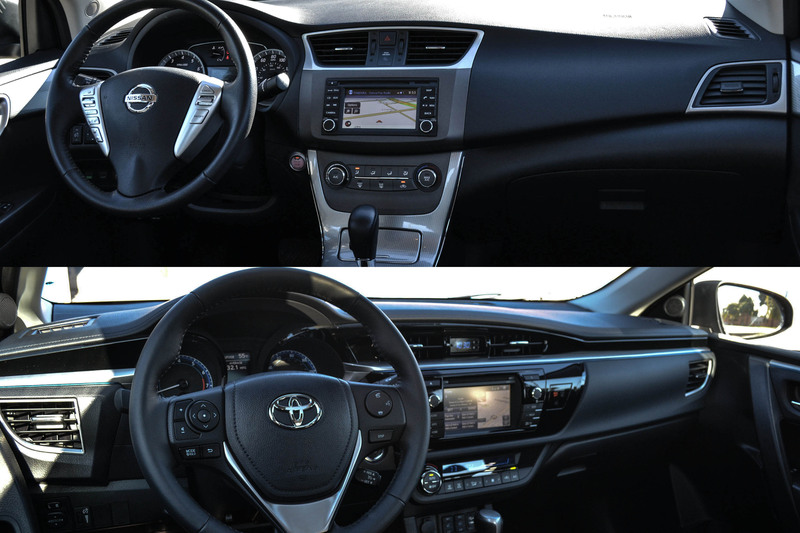 While the Corolla was more into the flat dash look with black leather split by piano black and blue metal trim. The seats in the Corolla also came in black leather with white stitching – included as part of the ‘S’ trim. They both came with the optional navigation package; the Sentra was more on the cartoonish side, but was still a relatively good set-up; even for being a $650 option. The Corolla on the other hand used Toyota’s latest software system: Entune. Entune is as a fantastic system that does offer a little more features than the Sentra, but then again it is a more expensive option too. They both had sensational interior volume giving passenger comfort a thumbs up. Both offered up a fair amount of head room and shoulder room. The Sentra did have a more lavish back seat that had more leg room and a center arm rest, where the Corolla did not. They both also had a generous trunk space with folding rear seats. At least when it came to performance both sedans are fairly equivalent in numbers; both offer a 1.8L 4-cylinder engine that uses a CVT transmission. The Sentra uses 130hp and 128lb-ft torque to kick up the asphalt from 0-60 in just 10 seconds. But that’s not as bad as the Corolla’s 132hp engine and 128lb-ft torque that delivers a dreadfully slow time of 0-60 in 11 seconds. If it was a race between the lights, the Sentra would win. Where the Corolla lacked in the drag racing, it made up in sport driving. The Corolla had the option to change over to manual mode and use steering wheel paddle shifters which made the drive more engaging and energetic. Whereas the Sentra felt more of a city commuter over something enjoyable to drive. The Sentra really showed off its CVT’s efficiency. Fuel economy averaged almost 35mpg combined between highway and city miles while the Corolla was on the lower end at 31mpg overall. When we tested the Sentra we were even able to achieve 50mpg’s on the highway – very economically… which was not easy. And when it comes to going the extra distance, the Sentra was able to achieve 350 miles of fuel after a $30 fuel up; although the Corolla could beat it by 50 more miles with a 400 mile range for $35 of fuel. Coming to a decision between these two was not easy. They both were excellent sedans in their own special way. But ultimately the Corolla won us over with its quality interior, energetic driving style, and overall felt just a hint more attractive in its exterior design. How was sport and normal mode on the Sentra? Was the testing only done on Eco mode? Since the Sentra uses a CVT transmission there isn’t much difference between all three “Sport, Eco, and Normal”. What Sport mode basically does is adjusts the mapping in the transmission to provide quicker acceleration. Because the Sentra only has 130-hp, the last thing I wanted to do was use eco mode – I really didn’t find any extra excitement using sport mode. Thats why I favor’d the Corolla a little more, the paddle shifters added that small fun factor. Good to know. Thanks for the info and reply! Was considering a 2014 Sentra SL fully loaded but now I’m not so sure.